I am waiting for the changes. Some I wait for impatiently, some I dread, some have to happen, some can’t. Changes are part of life. The only end to change in one’s life is the end of one’s life. I know this, but it doesn’t make some changes any easier. We’ve spent all summer working on the new house…talk about a change! The house is incredible and I cannot wait to move in, but I have to wait another week I think. There are still a handful of things that need to happen and I don’t want to rush in where we are living in an uncomfortable situation. It’s funny, I am dying to move in, but I am nervous and worried at the same time. My sisters are all having major changes happening in their lives. I am standing on the sidelines waiting to see who needs to be picked up. My stomach turns and churns watching and waiting for the last shoe to drop in all of these situations. I know that at least two of the sisters will come out stronger on the other end, but I can’t stand to see them hurt, but the other sis…I’m not so sure about. My girls have changed schools. We put them in the local Waldorf school after three years of public school for the oldest and one for the youngest. This was a very hard change to make. We fell in love with the school more than a year ago and have been planning this change for that long, but we still had tears from the oldest for the first couple of days. It’s funny, she knows that this is where they belong, but she is still homesick for the other school. They have both started to settle in and seem to really be blossoming. They are wonderful girls (yes, I am biased, but this is true). They are creative, curious, polite, full of wonder, adventurous, willing to try, and good hearted….all of these things seem to help them fall right in with the other children and I look at their classmates and am amazed to find such confident, grounded little beings. This has been a great change even with the challenges. Speaking of changes, there are some I need to make (or I should say, Henry and I need to make). On the health from the two of us are woefully unprepared to get older. We need to clean up our diets and start exercising. And I need to find a way to learn to let go of stress or at least not react so strongly to it. The summer’s stress has caused me a hard summer and at least one minor exacerbation. I need to get healthy physically, mentally and emotionally to lull my MonSter back to sleep. Once we finally get moved, the changes will be coming on that front. 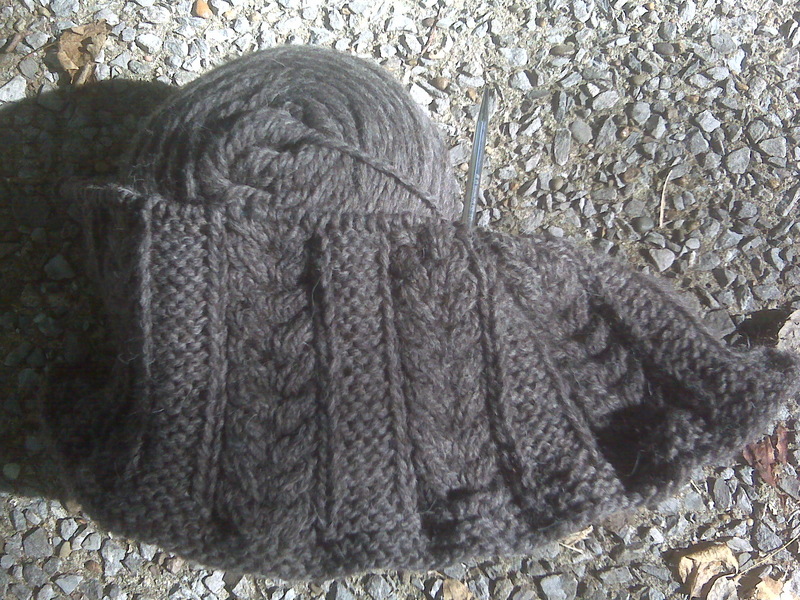 Now I know most of you bother with my blog more for pictures and knitting than for the dribble above, so ask me how I meet all of these changes… Well, I continue to knit. 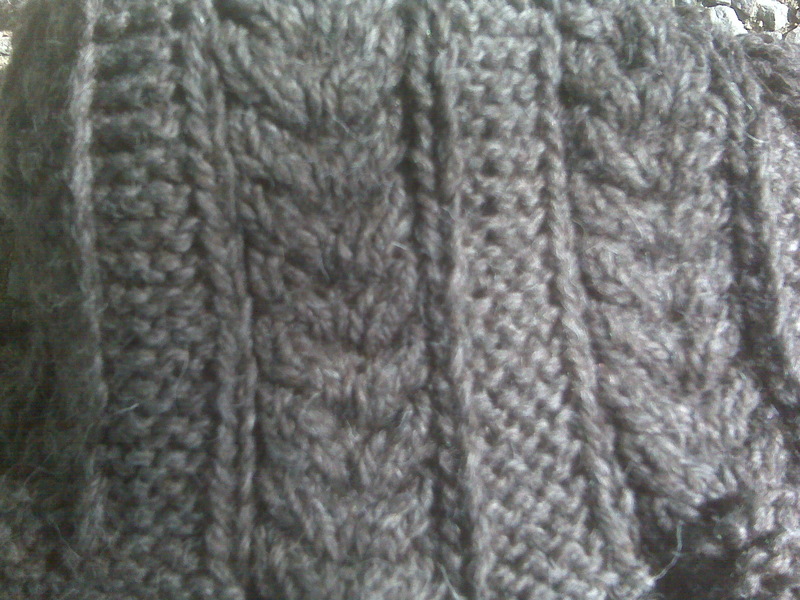 As Elizabeth Zimmerman says, “Knit on with confidence and hope, through all crises.” I have not exactly produced a ton, but I have managed to continue to knit a little here and there throughout all of this junk and have a few things to show for the effort. 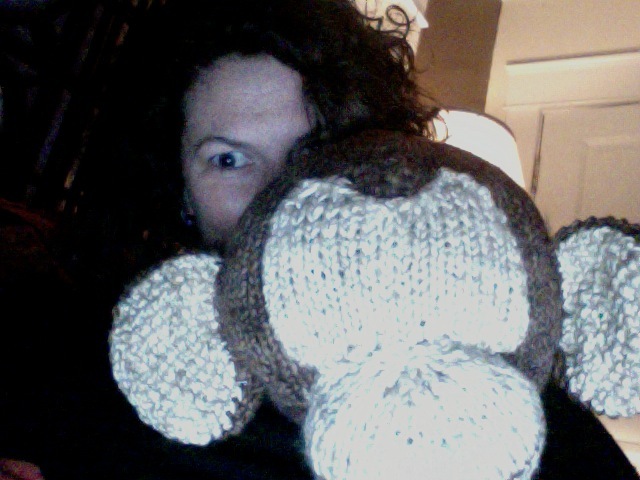 I made a baby jacket for a friend fo a friend and I knitted a big headed monkey for Mycah’s birthday. 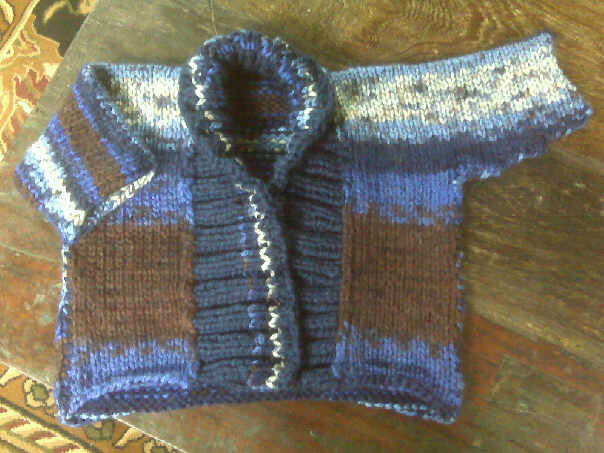 I also started a vest for me for winter. The only downside to the vest is that I have to borrow it back from the shop as Carolyn gave me the yarn to knit it for the shop sample! This entry was posted on September 4, 2010 by slippingthroughmyfingers. It was filed under family, knitting, MS and was tagged with baby sweater, elizabeth zimmerman, family, knitting, MS, multiple sclerosis. i hate that i’m part of the stress that woke your MonSter up – God i wish i could take that stress back! i’m happy for the girls and excited for your move.